Free admission. Wear something red! 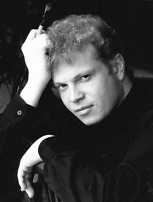 Feb 3 Book-Signing by Ray Kinstler! CSOPA's Faces of Winter weekend workshops have earned the reputation for extraordinary quality of education in an intimate setting. Now a biannual event at the prestigious Greenwich Arts Council meeting room. Tickets will go on sale in September. You are encouraged to check this webpage again for forms and details. Cost for both days is $200. Artist's Prospectus and Workshop Registration Forms will be available online by end-September 2005. Check this website again for updates. Click "Contact Us" button to be added to the Faces of Winter 2006 email list. Please specify FW06 Artist in the subject line. 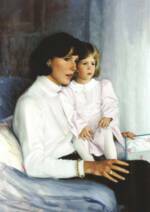 CSOPA's Lifetime Acheivement Award will be presented to Advisor Ariane Beigneux, foremost painter of children. 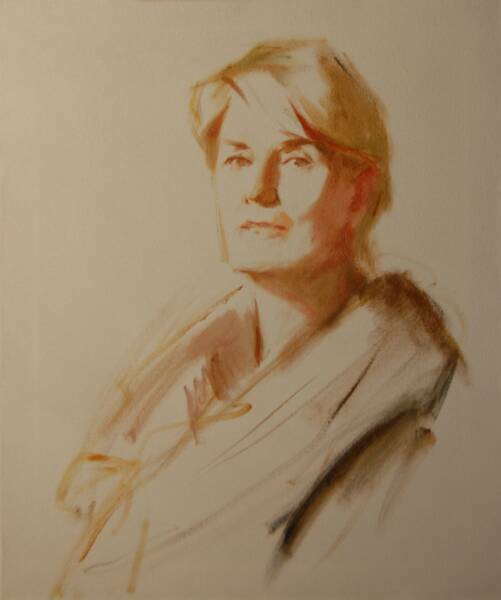 Video of the artist in her studio. .
**CSOPA Senior Advisor Robert A. Anderson has been a painter of commissioned portraits for 30 years; he has also created art for the advertising, publishing, and music industries. A spokesman and illustrator for the John J. Breck Company for 15 years, he created pastel portraits for shampoo print ads and commercials for American and Canadian television. He recently completed portraits of President George W. Bush, and former Massachusetts governors Edward J. King and William F. Weld. His outstanding images are included in many public, private, and institutional collections, as well as on 12 U.S. postage stamps. CSOPA is priviledged to have Bob Anderson as our Senior Advisor setting the example for quality and professionalism in portraiture. 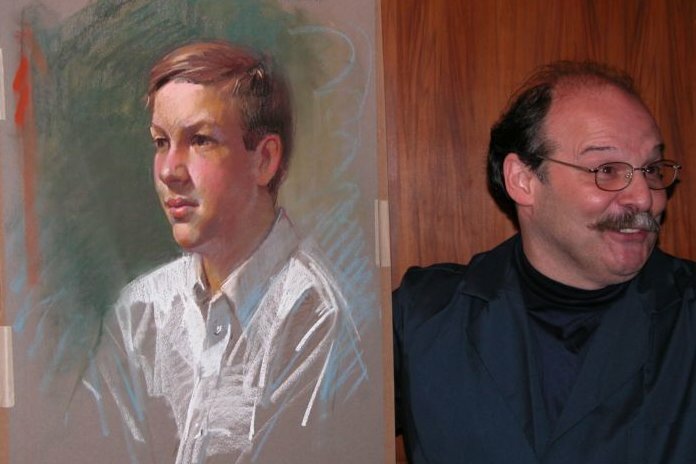 "The Five Basics of Portrait Painting." Portrait legend John Howard Sanden joins CSOPA Senior Advisor Robert Anderson** for their much-anticipated panel discussion. Joining them are select faculty members and special guest CSOPA Advisor and 2005 Lifetime Achievement Award recipient Foster Caddell . Topic tba. Q&A. 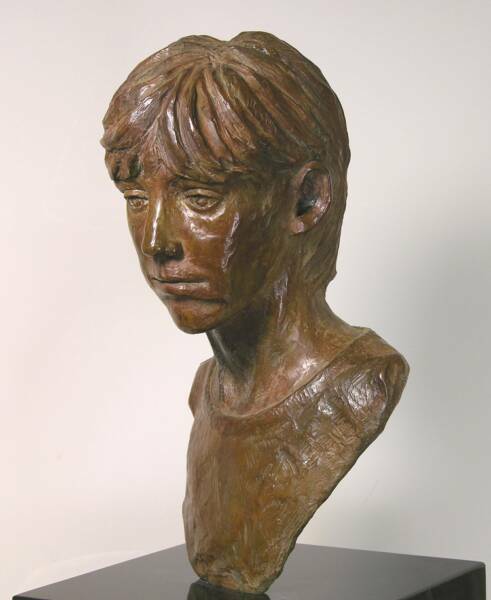 "The Boston School of Portraiture: A Way of Seeing." *About our judges: Among Ray Kinstler's more than 1200 portraits are such well-known personalities as Tony Bennett, Carol Burnett, James Cagney, Betty Ford, Gene Hackman, Katharine Hepburn, Lady Bird Johnson, Paul Newman, Peter O'Toole, Gregory Peck, and John Wayne. Five US Presidents have posed for him... Nixon, Ford, Reagan, Bush and Clinton. The Ford and Reagan are the official White House portraits. He is currently painting Donald Trump, and the official portrait of former Mayor, Rudolph Giuliani. 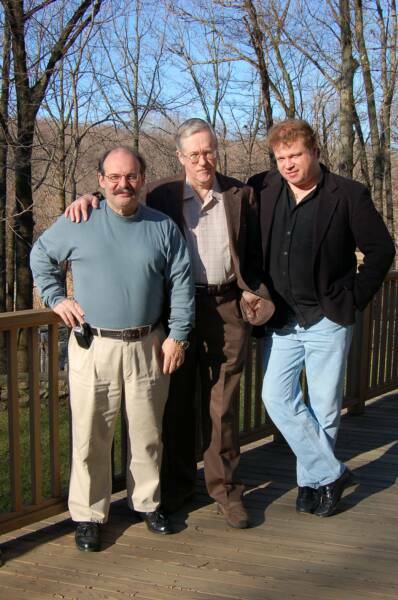 When asked who he would choose to co-judge FW06, Mr. Kinstler did not hesitate to name world-famous watercolorist and Silvermine instructor Charles Reid. Mr. Reid is widely published including his must-have "Painting Portraits in Watercolors" that Mr. Kinstler prizes in his own library. CSOPA is grateful to both great artists for judging FW06. 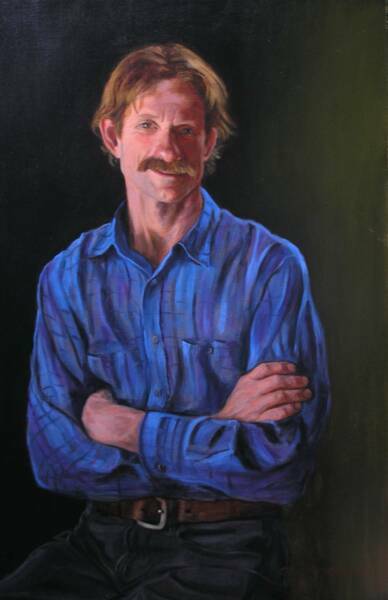 From the famous School for Visual Arts in New York, award-winning portraitist and sought-after teacher Marvin Mattelson returns to join the CSOPA faculty. Topic tba. 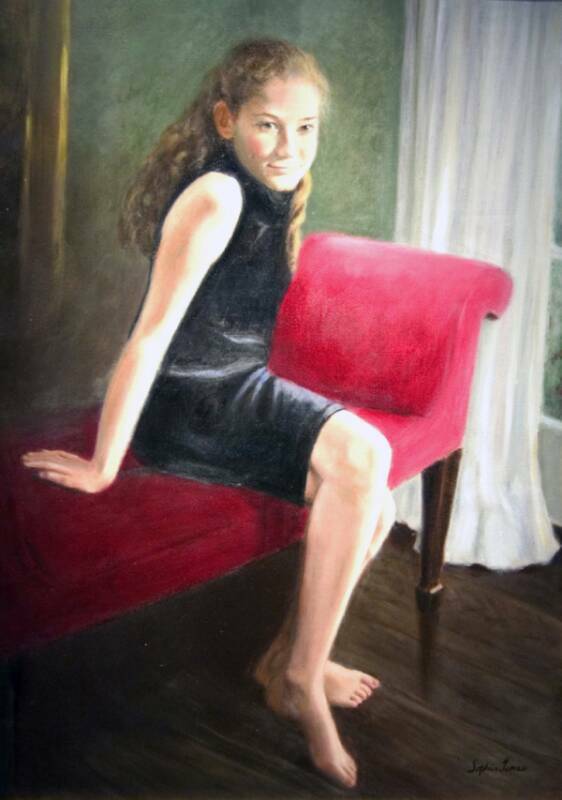 "The Colors and Palette of the Boston School"
Meet child-portrait legend Ariane Beigneux! 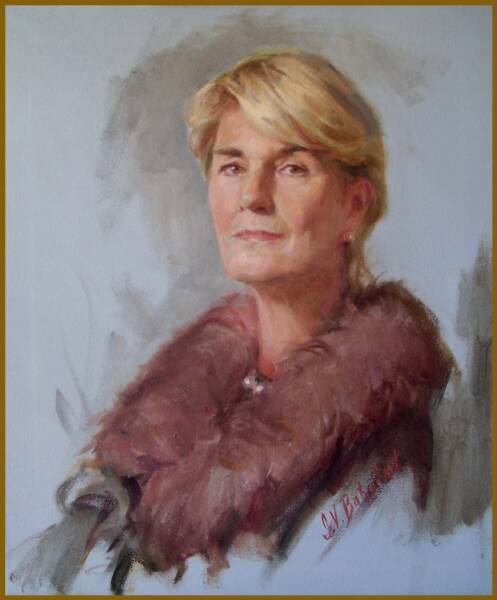 A Portraits Inc. veteran of over fifty years, Ms. Beigneux continues to thrill second and third- generation patrons with her unique painting-knife techniques and rich homages to beauty. CSOPA is honored to have Ariane as a trusted advisor. 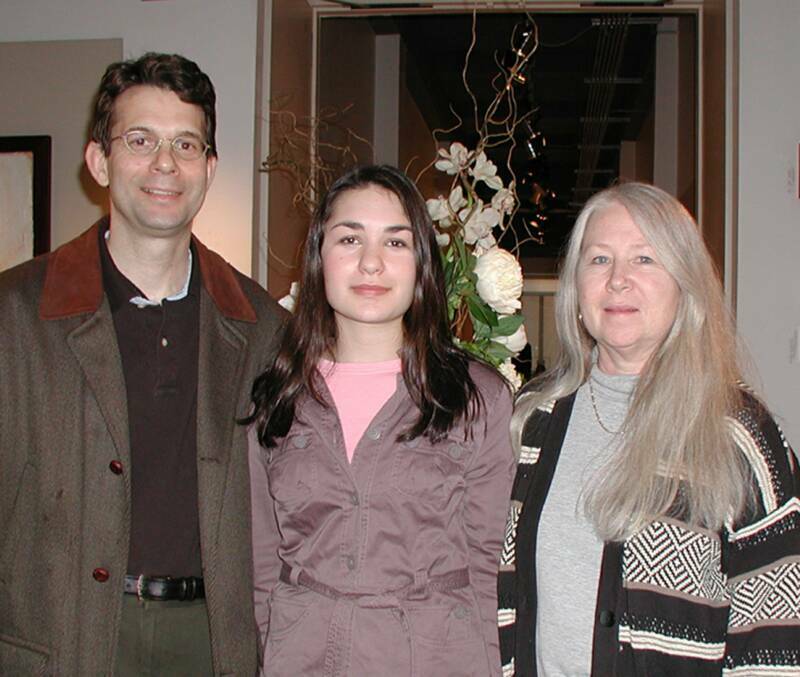 She co-judged our first exhibition Faces of Summer 2002 with Robert Anderson and has been a regular member of his panel discussions a strong supporter CSOPA ever since. Ms. Beigneux attends many CSOPA meetings where rarely a master artist is mentioned that she does not know personally. We are delighted to take this opportunity to say "Thank you, Ariane!" 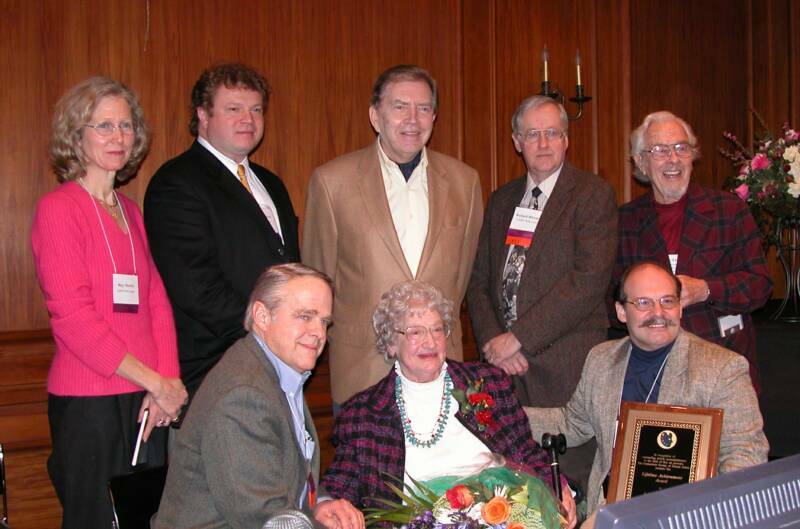 with CSOPA's 2006 Lifetime Acheivement Award which will be presented Saturday morning, February 4. 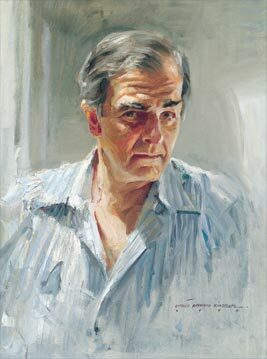 "How to Set up the Self-Portrait"
Artists please note: There has been a change in show dates to Feb 3 - Feb 26. Artists must now pick up selected works Sunday Feb 26 3pm-5pm. Click above to glimpse a past portrait festival. Use the links at the bottom of this page to learn more about CSOPA, a non-profit educational organization. 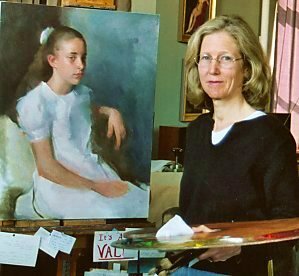 Image: Portrait of Amanda from the Norman and Suzanne Hascoe Collection by Sophia James, Winner People's Choice Award, Faces of Winter 2004. 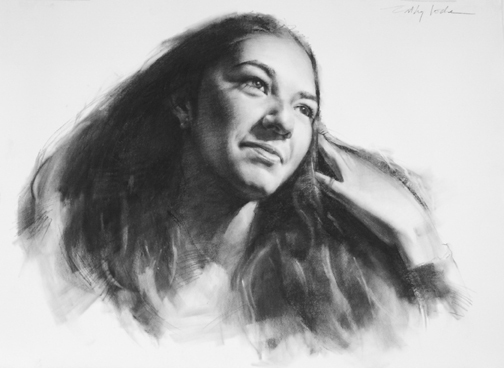 The Board of Directors of the Connecticut Society of Portrait Artists is pleased to offer a full scholarship to one deserving art student from Greenwich High School for the full weekend of portrait programs Feb 4 and 5, 2006. We recognize this as an extraordinary opportunity for a young artist to meet true celebrities in the field of classical portraiture in an intimate setting. 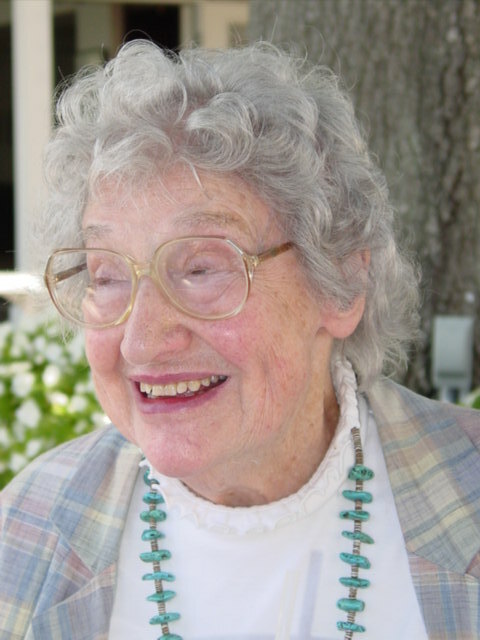 The winner, Ms. Sara Wilf, will be announced at The Bendheim Gallery for the Faces of Winter 2006 opening reception February 3. *FW06 Exhibiting Artists: Howard Aaron , Diane Aeschliman , Michael Alfano , Shin Young An , Jimmie Arroyo , Janice Baragwanath , Paul Batch (HM) , Paula Billups , Anne Bobroff-Hajal , Naomi Campbell , Kyra Carlson , Linda Champanier , Angalee De Forest (Seceond) , Diana De Santis , Jim DeCesare , Michel Delafontaine , Grace DeVito , Andrea Fenn , Nanci France , Douglas Gillette , Greg Gregorich , Debbie Hennes , Christine Ivers , Jeanine Jackson , Sophia James , Ilonz Kennedy , Zhiyi Li , Cathy Locke (Third) , David Luchak , Susan Margolis , Liz Jorg Mazi , Nikolai Melnikov , Ron Mineo , Madeleine Moriarty , Francis Philibert , Alain Picard , Christopher Pierce (First Place) , William Rorick , Marianne Rothballer , Julie Satinover , Miriam Schulman , Lucille Schur , Nancy Stember , Elizabeth Stone , Zimou Tan , Candace Taubner , Mike Tobin , AnnamarieTrombetta , Cindy Wagner , Sandra Wakeen , Joyce Zeller , Anthea Zito Click artist's name to email. *FW06 Exhibiting Artists: Howard Aaron , Diane Aeschliman , Michael Alfano , Shin Young An (Merit) , Jimmie Arroyo (Merit) , Janice Baragwanath , Paul Batch (HM) , Paula Billups , Anne Bobroff-Hajal , Naomi Campbell , Kyra Carlson , Linda Champanier , Angalee De Forest (Seceond) , Diana De Santis , Jim DeCesare , Michel Delafontaine , Grace DeVito , Andrea Fenn , Nanci France , Douglas Gillette , Greg Gregorich , Debbie Hennes , Christine Ivers , Jeanine Jackson (Merit) , Sophia James (Merit) , Ilonz Kennedy , Zhiyi Li , Cathy Locke (Third) , David Luchak (Merit) , Susan Margolis , Liz Jorg Mazi , Nikolai Melnikov , Ron Mineo (Merit) , Madeleine Moriarty , Francis Philibert , Alain Picard (HM) , Christopher Pierce (First Place) , William Rorick , Marianne Rothballer (HM) , Julie Satinover , Miriam Schulman , Lucille Schur (Merit) , Nancy Stember , Elizabeth Stone (HM) , Zimou Tan , Candace Taubner , Mike Tobin , Annamarie Trombetta (Merit) , Cindy Wagner , Sandra Wakeen , Joyce Zeller , Anthea Zito Click artist's name to email. Were you there? 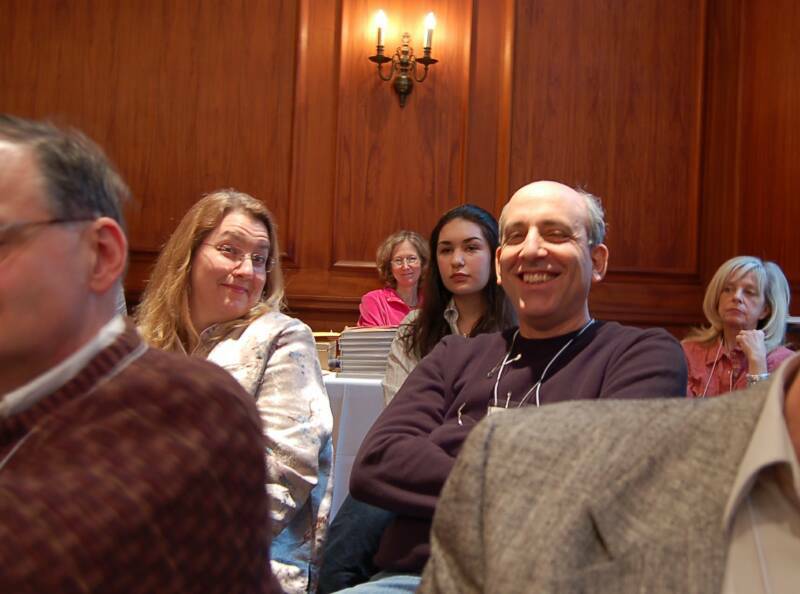 Please sign our guestbook and share your impressions of Faces of Winter 2006!